7th November 2017 - 3 is the magic number! We recently launched our Starter Bundle to help schools getting started with Catch Up® to get their ideal Catch Up® team in place, and, since then, we have seen lots more schools sending three members of staff to be trained together. 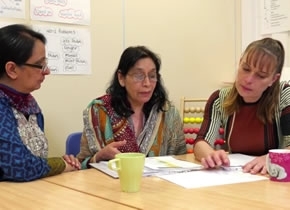 As well as the benefit this has when implementing the intervention in school, our Catch Up® Accredited Trainers have been pleased to report the positive impact this has in the training room as well! We know it's the best model for training but, recently, the constraints of budgets had made it happen less and less, and we were seeing more lone trainees attending, or a couple of trainees but no coordinator. We hope that the bundle offers have enabled schools to go back to best practice, which will give them the best possible start and, ultimately, enable them to help more struggling learners!